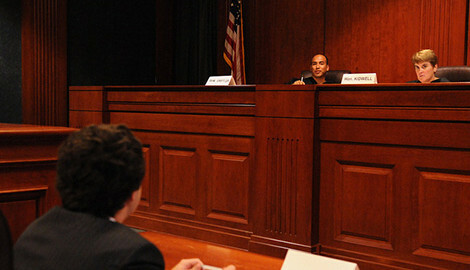 Judicial Internships are opportunities to work for a judge while you are in law school. Interns work with the judge and the judge's law clerks, and may be asked to research and write memoranda, attend trials and hearings, summarize cases, and help with administrative work. These are unpaid positions, but students may receive academic credit while interning with federal courts and state appellate courts in Austin during the school year and nationwide during the summer. Students may also receive academic credit for interning in Austin with the Travis County Probate Court and the State Office of Administrative Hearings. Through these hands-on experiences, students develop and synthesize their analytical, research, and writing skills, and broaden their understanding of judicial decision-making and the legal system. Students find it very valuable to watch the practical application of legal doctrine that they learn in class. Students experience judicial decision-making first-hand and hone their analytical, research and writing skills by apprenticing with judges participating in the Judicial Internship Program.